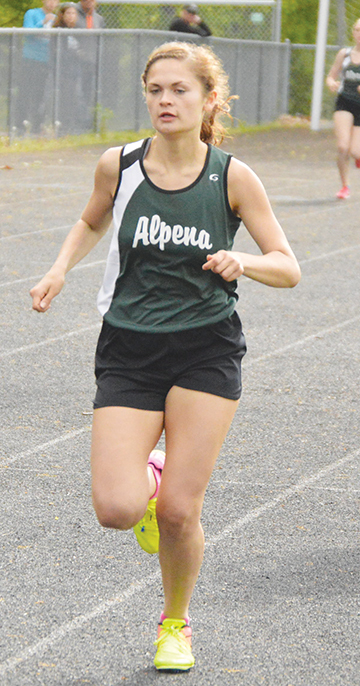 News File Photo Alpena track and field stars Eli Winter and Maddy Boyd got their seasons off to record-setting starts on Friday. Winter shattered Alpena’s male discus record while Boyd set a new female mark in the 3,200 run. DAVISON–Eli Winter and Maddy Boyd didn’t wait long to get their respective seasons off to an exciting start. 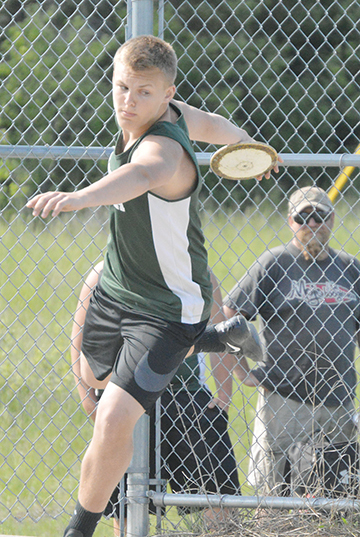 Winter shattered Alpena’s male discus record and Boyd set a new female record in the 3,200 run as Alpena opened its season at the Shake Off the Rust Invitational on Friday in Davison. Winter’s throw of 170 feet, 1 inch in the discus set a new school mark, beating Andy Gheen’s record of 161-8 set in 1977. “He was smiling from ear-to-ear. It’s a great start for him and the sky’s the limit for him going forward,” Alpenan boys coach Collin Riffert said. Boyd’s time of 11:21.88 in the 3,200 run also set a new record, topping the previous time of 11:24.11 set by Elaine Lowe in 2013. Alpena’s won the boys meet with 159 1/2 points, beating a field of 25 other teams including Caro (140), Holt (136.83) and Flint Carman-Ainsworth (129 1/2). Alpena’s distance runners came up big as Josh Smith won the 800 run (2:01.05) and the 3,200 relay team of Drew Seabase, Aden Smith, Josh Smith and Jacob Kochanski won (8:13.90). Seabase took second in the 800 run (2:01.73) and 4th in the 1,600 run (4:44.67). Josh Smith was second in the 1,600 run (4:30.23) and Aden Smith was second in the 3,200 run (9:58.78). Madi Szymanski was Alpena’s lone female winner, pacing the field in the 800 run (2:29.09). Boyd’s time in the 3,200 run was good for second place and she also took second in the 1,600 run (5:20.09). Gabe Bullis got his season off to a solid start with a win in the pole vault (14-9) and Haydn Goebel paced the field in the 110 hurdles (16.59). Alpena’s girls team finished ninth out of 26 teams with 91 points. Plymouth won the girls meet with 134 1/2 points and Birmingham Seaholm was second with 133. “I was surprised at how high we placed– ninth out of 26 and fourth in our division–(and it) exceeds my expectations,” Alpena girls coach Joy Bullis said. “The girls really pushed through. They showed a lot of determination and tenacity. We are coming home with 23 medals earned in 12 events. (I’m) very happy with this group of girls.”Savannah Thomson finished second in the 100 hurdles (18.08) and Faith Weide was runner-up in the shot put (36-5).Other top finishers for the Alpena boys included: 400 Run–6. Jadon Duncan, 54.24; 110 Hurdles–4. Zach Zaborney 17.51; 300 Hurdles–3. 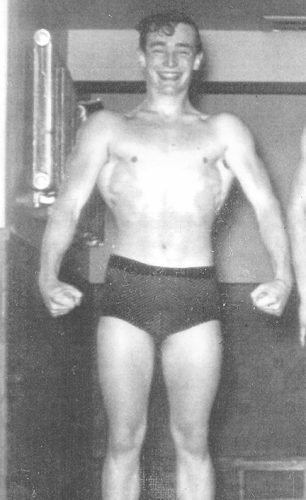 Haydn Goebel, 43.38; 3. Zach Zaborney 44.78; 6. Wenton Harrison, 46.79; 400 Relay–6. Kody Bertrand, Dylan Fleck, Bob Sheldon and Zach Schaedig, 48.33; 800 Relay–4. Bertrand, Fleck, Sheldon and Cooper Bright, 1:38.73; 1,600 Relay–3. Bright, Duncan, Haydn Goebel and Kolton Goebel, 3:43.02; Shot Put–2. Winter, 48-5; 6. Sam Romero, 41-8 1/2; High Jump–2. Haydn Goebel, 5-9; 3. Caleb Zaborney, 5-6; Pole Vault–3. Josiah Matuzak, 11-0; Long Jump–3. Zach Zaborney, 20-4 3/4; 6. Duncan, 19-2.Other top finishers for the Alpena girls included: 1,600 Run–3. Szymanski, 5:33.44; 300 Hurdles–3. Thomson, 53.36; 400 Relay–6. Ashley Bridgewater, Karli Myers, Paige Timmreck and Samantha Tadian, 59.45; 800 Relay–5. Bridgewater, Tadian, Tiffany Foster and Alexis Reynolds, 2:06.30; 1,600 Relay–4. Foster, Thomson, Boyd and Szymanski, 4:39.07; 3,200 Relay–3. Szymanski, Grace Mitchell, Kaylee Rondeau and Molly Dickinson, 10:46.29; Discus–3. Weide, 108-5; Pole Vault–4. Tadian and Brylie Carstens, 6-0. 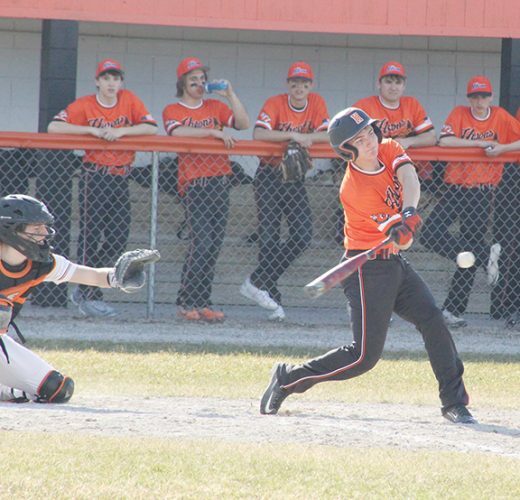 ST. CLAIR — The Alpena baseball team traveled to St. Clair on Friday and came away with a split against the Saints. The Wildcats had the offense going in game one, collecting 18 hits as team in the 15-5 victory that needed just five innings. Alpena was led by Alex Cosbitt who went 4-for-4 with four RBI and a run scored. Along with Cosbitt, the Wildcats had six other members of its lineup record multi hit games. Bruz Copping went 3-for-4 with an RBI and picked up the win, pitching five innings, allowing two earned runs on six hits and struck out four. Kyle VanDusen, Keegan Spomer and Owen Limback each had two hits and drove in a pair of runs. VanDusen and Spomer scored twice and Limback crossed the plate once. VanDusen also homered in the game. Aidan Goike added two hits, scored two runs and had an RBI out of the leadoff spot. Colin Donajkowski went 2-for-4 with run scored and Chris DeRocher had a hit, walked, an RBI and scored two runs in the game one win. 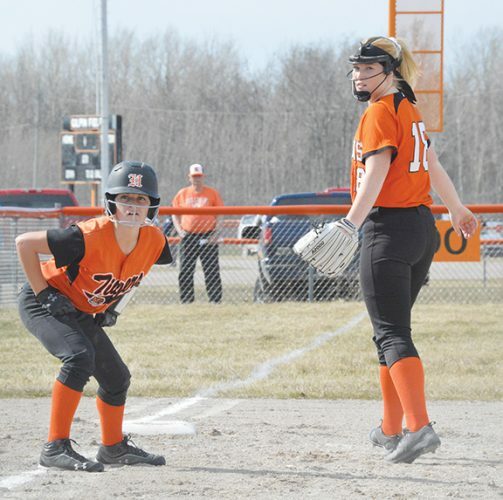 The nightcap was a different story as Alpena was on the receiving end of an 11-2 loss. The Wildcats were held to six hits and scored their only two runs in the sixth inning. St. Clair broke a scoreless tie in a big way in the fourth inning as they scored six runs in the bottom of the fourth and added three more in the fifth to take a 9-0 lead. Colby Plowman walked twice and scored a run and Cosbitt walked and scored Alpena’s only other run. Goike, VanDusen, Copping, DeRocher, Limback and Colin Donajkowski each had a hit in the losing effort. Spomer got the start and gave up four earned runs on seven hits across four innings, while striking out a pair. Riley Arlt and Clay Donajkowski each tossed an inning in relief, allowing a combined five earn runs. Alpena is now 1-3 overall on the season. The Wildcats return to the diamond on Tuesday when they travel to Mt. Pleasant. TAWAS — The Alpena girls soccer team put together a strong performance on Friday, earning a shutting victory over Tawas, winning by a score of 4-0. The Wildcats scored three goals in the first half to take a 3-0 lead and added one more in the second half to cruise to their second shutout win in their first three games of the season. Anna Young and Taylor Tolsdorf both added a goal and an assists and Kami Schultz and Alexis Pilarski added the other two goals. Jenna Leeck and Kennedy Kaiser both chipped in with assists. “We’re playing real strong possessional soccer and we have been strong defensively,” Alpena coach Tim Storch said. “The key to our defensive success so far has been the play of our junior captain Macy Dickinson who has really shown great leadership with her play on the field and ability to rally the team off the field. Edie Zann and Alexandria Villarreal combined to shutout the Braves. Alpena improves to 2-1 overall and will play host to Boyne City on Tuesday in the Wildcats’ home opener at 5 p.m.